Well that was gruesome and awesome and thrilling. 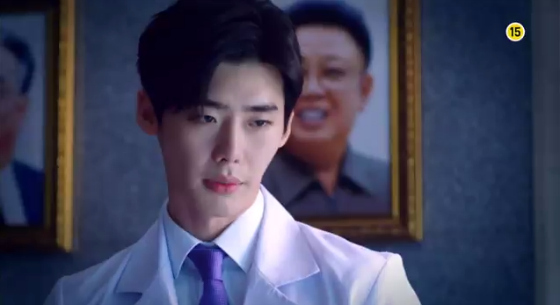 Doctor Stranger, SBS’s new Monday / Tuesday drama , premiered yesterday and…yeah…..I will never get used to how graphic some of these medical dramas can be. My squeamish nature aside there is a lot going for this drama right out of the gates. Time for the residents of Stone Cities to weigh in. Release the hounds! Park Hoon was born in South Korea, as a child he was kidnapped by the North Korean government. He grew up in North Korea with his father (who was sent there to avert war). Hoon eventually escapes the north, but leaves behind his fiancée, Jae Hee. Now employed at the top hospital in South Korea, Hoon works to rescue his love from a totalitarian regime. Jae Hoon is a medical doctor with a shiny Harvard degree. He works at Myungwoo University Hospital, alongside Soo Hyun and Hoon. He is engaged to the former and recognized the latter’s talent at medicine. Jae Hee was born and raised in North Korea. As a teenager her Father was accused of political crimes, as a result she was sent to a concentration camp with the rest of her family. She is engaged to Park Hoon. Soo Hyun is a doctor at Myungwoo University Hospital. She is engaged to Jae Hoon and is the daughter of the Hospital’s chairman. 1994- Park Cheol is a top thoracic surgeon living in South Korea. One day he is approached by the government and told that he needs to go to North Korea to treat a very important patient -it is a matter of national security. It seems that the United States is planning to bomb North Korean nuclear facilities, their plan hinges on Kim Il Sung dying from a major heart ailment. Park Cheol is to go north and save him, therefore averting a certain retaliation on the South. After traveling to the North, Park Cheol realizes his son Hoon has been kidnapped. 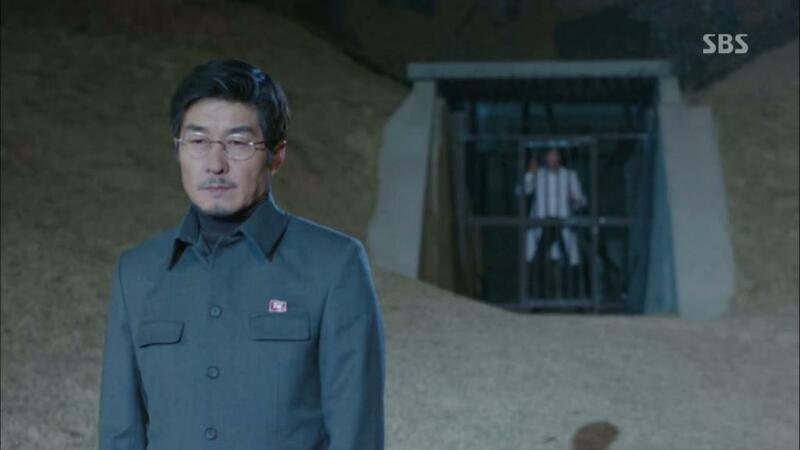 The North Koreans threaten to kill Park Hoon unless Kim Il Sung survives the surgery. Park Cheol completes the operation successfully, shortly thereafter he is informed that he and his son will not be able to leave North Korea. 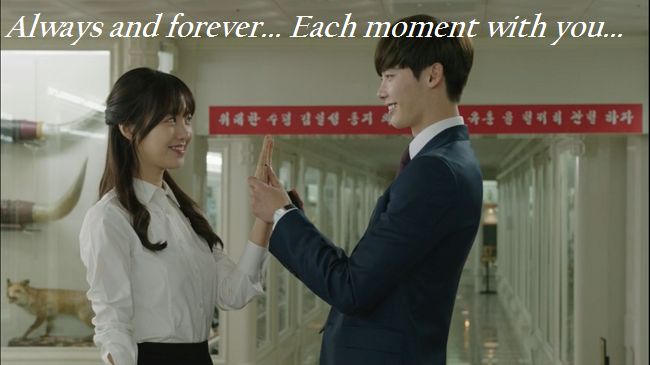 Flash forward some years and Park Hoon is in high school. A feisty kid, Hoon sells bootleg K pop tapes to fellow students. His goal is to earn enough money to buy a ring for his lady love, Song Jae Hee. Hoon is eventually able to propose but shortly thereafter Jae Hee and her family are taken to a concentration camp due to a political infraction commited by her Father. After Jae Hee is sent away, soldiers come for Park Hoon. He is sent to an experimental medical facility and trained as a Doctor, performing gruesome human experiments as directed by the North Korean Government (with an end goal of serving the Dear Leader as a personal Doctor). Due to his talent as a thoracic surgeon, Park Hoon is chosen to go to Budapest in an attempt by the North Korean Government to win medical supplies and equipment from Western countries. Hoon’s father urges him to escape when he gets to Budapest, asking him to seek political asylum at the South Korean embassy. Hoon refuses. His Father fears that he is holding his son back so he sneaks into a forbidden area and is shot – hoping his death will spur his son to action and ultimate freedom. Matters are complicated when Park Hoon is reunited with his love- unfortunately she is sent to the medical facility to be killed (her heart is supposed to be transplanted into her Father). Hoon pulls a switcheroo and saves her (after her Father begs him to do so). He departs for Hungary with Jae Hee (and a bevy of North Korean handlers). Once in Hungary Hoon plans an escape. He manages to leave the hospital with Jae Hee (thanks to help from a German doctor) and makes it to the South Korean embassy. The embassy refuses the couple asylum due to Hoon’s Father’s past (his country essentially abandoned him to North Korea, this being an election year the Prime Minister does not want such news to surface). The couple flee, with their North Korean handlers in hot pursuit. During the chase Jae Hee is shot and falls into a river. Hoon is also shot; the police show up and we cut to black. The story fast-forwards two years and we find Hoon living in South Korea. He has a back alley medical clinic where he operates on gangsters and other shady characters in an attempt to earn enough money to rescue his fiancée from captivity in North Korea. His hope lies with a man who has smuggled out North Korean defectors in the past. Finally, after so many years, Hoon is shown a video by the smuggle-people-out man that displays a bruised and battered Jae Hee, calling out Hoon’s name. He reaches towards the image, his eyes watering. The pace and solid narrative displayed in the first week has me just a wee bit giddy. I was on the edge of my seat for both episodes and was groaning when I realized there was no more of this show to watch. The setup has been enticing to say the least and my drama watching brain is pleased. And Lore was happy this day. Very happy indeed. Hoon as the hero interests me, his character has an edge to him that is intriguing. He has a morally questionable past – like that whole North Korean human experiment job- and a morally upright desire – his wish to save. Hoon seems aware of and struggling with the wrongs he has committed (when he stated that they live “somewhere where even doctors kill” and that groan of anguish that killed me looking at his abs during the shower scene). Different motivations and circumstance drive each side of him; the totalitarian state, his relationship with his Father, and his love for Jae Hee have shoved him down different roads. We are so, so early in this story (I can never seem to say that enough during first impression posts, sorry for the redundancy) so the most I can say is I am very, very interested in where this character is going. I am for the most part on board in regards to the cast. 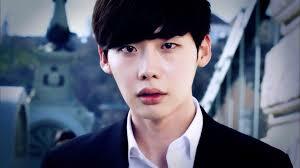 Lee Jong Suk is a good actor and I do not doubt that he will portray Hoon in an interesting and impassioned manner. Jin Se Yeon I am less thrilled about. She has never really grabbed my attention as an actress. Granted I have not seen her in all of her works (and I have a horrible taste in my mouth due to her last role in Age of Feeling), but there is just something about her that seems to lack…I don’t know…believability. I am hoping Se Yeon proves me wrong in this drama and I walk away a fan. I am loving the extended cast. There are a lot of actors popping up here and there that I have enjoyed in other works – Cheon Ho Jin, Choi Jung Woo (Ahjussi Secretary! ), Jung In Gi, and Kim Sang Joong to name a few. Most of these awesome peeps have worked with this director before so it is a mini reunion of sorts. For some reason I decided to fill my drama bucket to the brim with a total of 6 concurrent live watches. 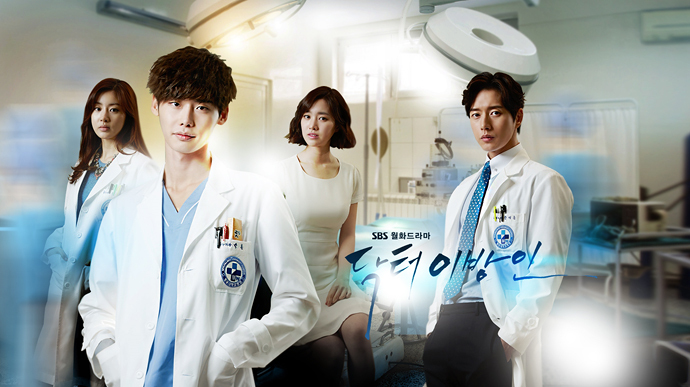 It is a good sign that in the first week Doctor Stranger already jumped to my 2nd favorite currently-airing show, second only to the amazing jTBC show Secret Love Affair. In other words, this show has set the bar pretty high, here is hoping it meets the standard it set in the first two episodes. Cheers! (Sorry, I mentioned bar, thought I dive right in). So I am giving my comments after the first episode because I am completely catatonic and not sure I will be able to stick with this drama. Ekun’s good, bad, and ano…. 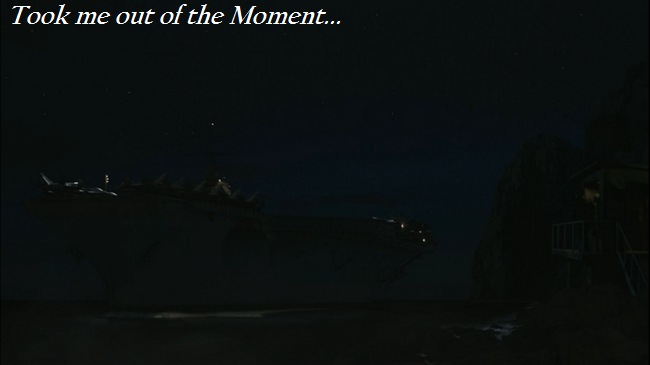 The scenes with the tanks, ships, and CG effects… I was looking at it like it was out of portion or just really poorly done. Most of the time, I do not really care about stuff like that, but it took me out of the moment because it was so questionable as I looked at it. Another thing that pissed me off was the US trying to bomb the North without thinking about the South… then I realized I feel some kind of way because I am a westerner; and this show was made for and by the citizens of Korea. But it still seemed foolish because, if I am not mistaken, we are allies with the South– perhaps that came after the year of 1994? Anyway, the reasoning for getting us into the North was a little farfetched in MY honest OPINION (opinion being the key word folks). This is the second time I have seen a drama where the South has sent someone (or a group) to the North for bidding and then tries (or succeeds) to kill them for covering their tracks! Isn’t that a form of treason?! 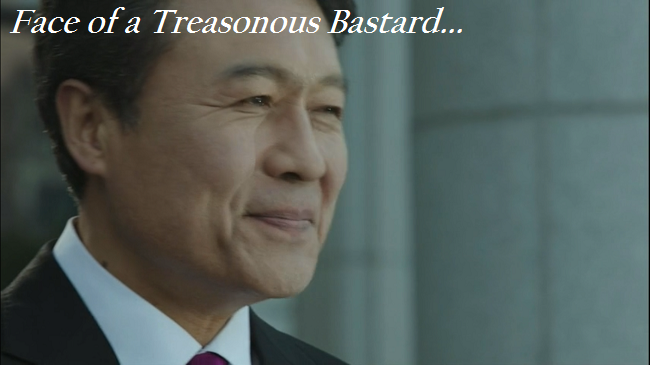 You betray your countrymen for what? Fame, power, money, etc… Whatever it is I hate it and it made me want to throw up my ice cream when assemblymen Jang said something about there can’t be two heroes- blah, blah, blahr (I didn’t pop popcorn while watching this episode)! What I really want to say is not appropriate for young readers, but know that Ekun had A LOT of choice words. 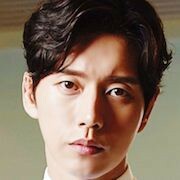 I am not sure if I will be able to continue on with this show, but perhaps when Park Hae Jin makes an appearance, I will be more inclined to get more invested in the story. I hope all those that are enjoying will continue to enjoy it, and those who are skeptical (like myself) will be able to suspend reality enough to enjoy it or just “Call it a day” Peace! E-kun- how did you feel about King 2 Hearts? I loved that drama and I am liking this one so far, but I see your point on the far fetched bits. I think I must like far fetched. Aish, I am hopeless! I liked King 2 Hearts, but I knew more about the premise before I saw it so I was able to buy into it. I think since I am not reading that much on stories before I watch them is a plus and minus. I knew he was in the North and was going to be escaping, but everything around it just wasn’t quite well thought out to me. I could see that. I was surprised on the backstory of how he got to the North, I was thinking he was born and raised there and then defected, not sent there with his Dad as a hostage (plus the whole medical experiment job thing was something I never, ever expected. But I think that gave the character a nice edge no matter how strange and grisly it was). The CG made me laugh, lol. It does take you away from the show for a second, doesn’t it? Overall, I wasn’t thrilled with the show, but I’m going to keep watching to see where it goes from here.